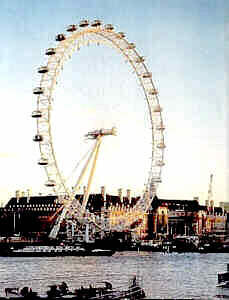 "LONDON EYE"; The World's Largest Observation Wheel. 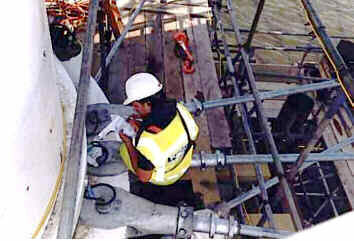 Design and Construction of the Monitoring System of the Cables Tension Variations. The need to verify, during the construction and always in the time, the uniformity and the regular distribution of stresses on the numerous (64 + 16) spoke cables. This is important to avoid over-stressing of cables and/or of ring components. The need to verify the amount of pre-stressing loads that must remain over the minimal value to ensure the stiffness of the whole structure in relation with the maximum allowable deformations and the reduction of the wheel's elements fatigue strength. The lowering of pre-tension loads, mainly caused by the viscous effect due to the alternating stresses that derive from the rotation of the wheel, is a normal condition. However, because of the relative weakness of ring elements, it is impossible to pre-stress excessively all the spoke cables. The opportunity to verify the amount of cable stresses in all the steps of the construction and during the lifting. For the unique and particular type of construction it is impossible to use the traditional methods to control and verify these important parameters. The design of the monitoring system is the result of the co-operation of TENSOTECI, the firm that realised the whole cable system, and SER.CO.TEC., a firm experienced in monitoring systems and non destructive controls. At first the examination of all the mechanical characteristics played an important role. The formulation of all possible solutions was the second step. The third step was the evaluation by analysis and calculations of the real dimensions of active elements. The successive step was dedicated to the optimisation of constructive details to improve the reliability and the facility of construction. 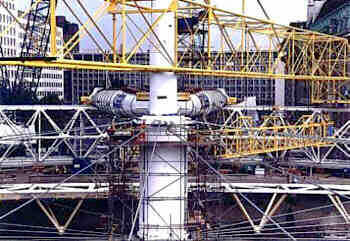 When the project was approved, the principal parts of the wheel were under construction, in particular the cables and all the associated elements. Further restrictions were the limited dimension of mechanical elements, space where to fit the sensors, and the scarcity of time to realise, test and ship 80 heavy transducers plus all the suitable electronic devices. from 0 to 1000 kN for rotation cables. Reading's resolution 5 kN (obtained 1 kN). The system is divided in two independent sections, 40 points each, to achieve the optimum in reliability. Possibility to carry out the measurements either in situ or from a remote position, with connection to the rotating part of the structure. Possibility for theoretical and practical calibration of transducers in the laboratory and in the field. Minimal impact on mechanical system. Endurance and durability in the particular environment with reduced maintenance. All the work for the complete definition and design of the monitoring system was carried out in a month. All these activities were carried out by SER.CO.TEC. in Trieste where a specialised firm, Gruppo Tecniche Avanzate, had the task to build all the electronic devices and the University had been encharged to calibrate all the transducers. The chosen solution requires the application of strain gauges on the pivots that anchor the spoke and rotation cables on the central hub of the wheel. The location of sensors on this end of the cables is useful to concentrate all the electronic devices in two points at the ends of the hub. The mounting and assembling of all the amplifiers and wiring remains simple, requires less time while it ensures better reliability. A couple of strain gauges was mounted on each pivot, at mid span and in the position of maximum bending deformation. The electrical arrangement, in Weatstone bridge, minimises all effects (thermal, axial, etc...) but for bending. The pivots were lathed to obtain the necessary space for strain gauges and relevant wiring. A special multi-layer coating was applied to shield the sensible wiring and strain gauges against moistening and mechanical shocks. Two holes, one drilled in the axis of the pivot and another, orthogonal to the first, drilled at mid span, are used for the passage of the electric cable connected to the strain gauges. Finally, the holes are filled with polyurethane rubber. Several analyses, with different mathematical approaches, were carried out to find the correlation between the load in the cable and the strain measured on the pivot. The same studies were used to evaluate the mechanical strength of the modified pivots in connection with the project load and strength fatigue specifications. At every turn of the wheel the strain of the spoke cables has a cyclic variation of about 600 kN and so for 10,000 cycles in a year. With the modified pivot the connection between spoke cable and hub of the wheel is stronger than the cable alone. This was experienced with rupture tests for strength and with suitable calculations for fatigue life. As the used technique and the mechanical configuration are not very usual for similar transducers (in other terms they are particular load cells) a complete calibration is needed for each element. In order to avoid possible confusion each modified pivot was numbered and was associated to a corresponding numbered electronic signal conditioner. At the University of Trieste, Laboratory for Testing Materials, suitable equipment was installed to simulate the same load application to the pivots as they would be loaded on the wheel. The test equipment was designed and realised by TENSOTECI; the load generator and the measuring instruments, all supplied by the University, were a 1000 kN universal testing machine and some normal data loggers for data acquisition. All the pivots were tested and for each couple pivot - electronic conditioner were carried out the reading for zero load and the reading for 1000 kN. Eleven samples were further tested in steps of 100 kN to check the overall linearity. As the tested linearity was better than 1% full scale, the number of eleven specimens, casually chosen, was considered adequate to suppose that all the specimens have a linear load - output signal response. 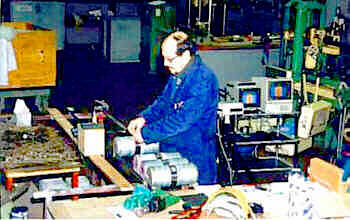 Particular care was required during calibration for the proper position of the pivot in the testing arrangement. A limited number of cyclic loads from zero to 1000 kN was sufficient to stabilise the mechanical adapting and the readings. The initial cyclic load is similar to the cable vibration at the moment of installation on the wheel. A table with all the values of single calibrations and all the graphics of linearity testing were provided and delivered with tested transducers. While the spoke cables were fitted between the ring and the hub and the pivots were installed on the wheel, the wiring and the housing for all the electronic components were assembled inside the hub. At each end of the hub, all around the circumference, through 40 little holes, 40 electric cables bring inside the signals of the relevant 40 pivots (which correspond to half of the transducers). Completely around the hub's circumference, a suitable housing contains the wiring and the 40 electronic conditioners. In a metallic box fastened to the rotating wall of the hub were located the main data logger, the power supply and the modem connected to the mobile phone net. At this time the future wheel is lying horizontal on the river Thames and the work inside the hub is not too hard because we can stand on a flat platform. Near left and right ends are located the boxes containing the electronic equipment. Section of the hub and position of the box containing the main electronic equipment. As soon as the system was completely installed and running the operating tests began. The spoke cables, also in the relaxed condition, are subject to axial loads although not so strong as when the wheel is in the vertical position. During these tests it was possible to read loads of 20 - 30 kN and to detect the effects of vibrations and oscillations produced shaking the spoke cables by hands. Afterwards the system was used (in situ) to monitor all the activities for the pre-stressing of spoke cables. The wheel was still in a horizontal position lying on temporary bearings. The pre-stressing was accomplished using hydraulic jacks applied, in subsequent steps, on the ring-holdfasts of spoke cables and moving the equipment around the wheel from a spoke cable to another. With the monitoring system it was possible to read and measure all the effects and the evolution of the pre-stressing on all the spoke cables. The measurements were very useful in all the activities concerning the adjusting of each cable pre-tension. After the pre-stressing phases the system was regularly used to monitor, step by step, the load variations in the spoke cables during all the phases of the wheel lifting. In about 10 days the wheel was raised from the horizontal position to the final vertical position. In the final position the spindle and the hub are at a height of about 70 meters while the maximum height of the ring is 135 meters. During all the rising phases the measurements of spoke cable were taken continuously. The measurements were in accordance with the calculated values for all the intermediate position of the wheel. Subsequently the wheel construction continued, the rotation and the installation of passenger capsules began. At this time the remote utilisation of the system began. All the electric cables were disconnected from the hub and the connection through GSM mobile phone was activated. From our Italian offices, the stresses were measured in the different phases of rising loads due to the passenger capsules installation and to the viscous deformation deriving from the first cycles of rotation. All these readings and measurements were achieved during the first two months of the wheel's operating life. The measurements gave the necessary information for the fine adjusting of the tensional distribution. This was the final phase of the construction and the general testing. Now the readings and measurements are continuing for the periodic control of loads, for the analysis of slow variations and decay of mean loads, to foresee the moment for the readjustment of tensions and to verify the absence of anomalous conditions. who demonstrated a particular interest and an exceptional availability in all the phases of job execution.